Reusable 16oz. water bottle. 75% post consumer recycled glass. Naturally BPA-free and PVC-free. Grippers and caps are made of food-grade silicone. All materials are FDA approved. Dishwasher safe on the top rack. I ordered these to put our refrigerator filtered water in and they do a great job. I would not take these in the car with us as there’s no protection for the glass and the heat of the day warms the water quickly. I bought 2.. my adult kids loved them. They immediately commented on the fact that they are glass and thought they would be great at work. This is my 4th purchase. :) Now I own 4. Niece loved it... and knowing it was upcycled and helped out someone made it all the more special in my book! When you sit down to have a glass of water, most of the time you have it in . . . a glass. Most of us prefer to sip out of glass because it’s non-porous, nontoxic, doesn't affect the taste, and is just plain comfortable. But on the go, we use plastic—which can have environmental ramifications—or metals—which can affect the taste. If only a reusable glass water bottle were practical . . .
That's what architectural glass designer Laurel Herter thought, so she set about creating one. Although she'd seen eco-conscious folks sipping water from mason jars, she found the jar lip uncomfortable. She decided to try her hand at a redesign, and after crowd-sourcing reactions to 30 different wooden models, the unanimous favorite was passed along to glass blower Jonathan Poirer to create the bottlesUp prototype. The glass cores are made in Mexico by a company with its own curbside recycling program, with at least 75% of the glass is recycled on site, and the food-grade silicone grippers and caps are made by a company in Maine. Each bottle is then assembled by Programs for Exceptional People, a group of special needs adults in Hilton Head Island, SC. The end result is that these unique and eco-friendly bottles are 100% sourced in North America. Everything is naturally PVC- and BPA-free, plus bottlesUp boasts the lowest carbon footprint of any water bottle in the industry. 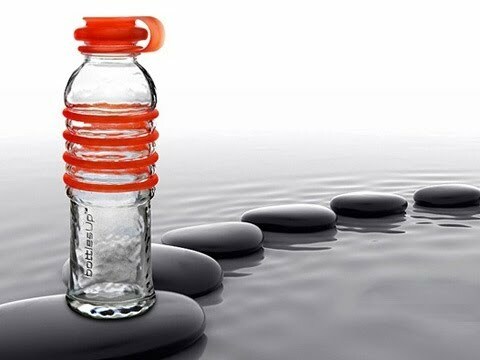 For everyday usage, bottlesUp is comfortable, sturdy (the silicone grippers mean it can survive most tumbles, but be careful on pavement), stylish, and dishwasher-safe. Bottoms up!